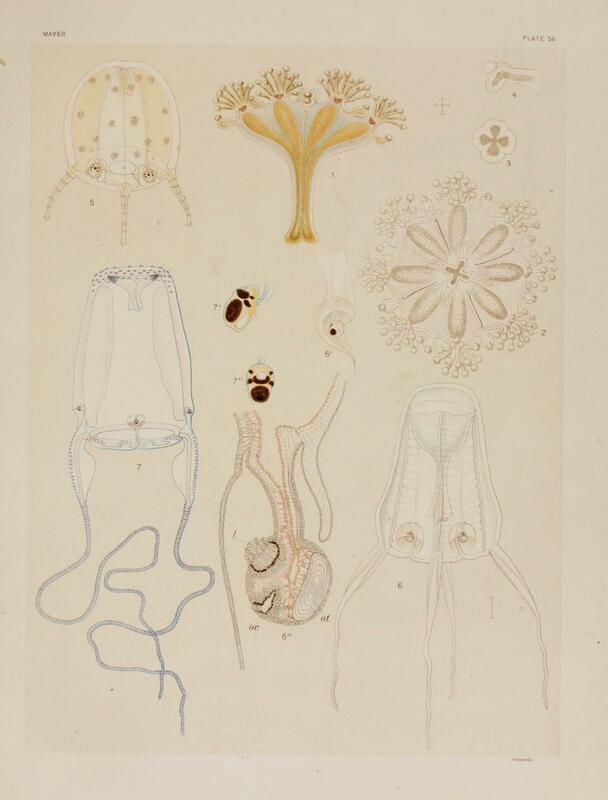 Stauromedusae UK - Haliclystus salpinx Clark - Medusae of the World by Alfred Goldsborough Mayer. 1910. 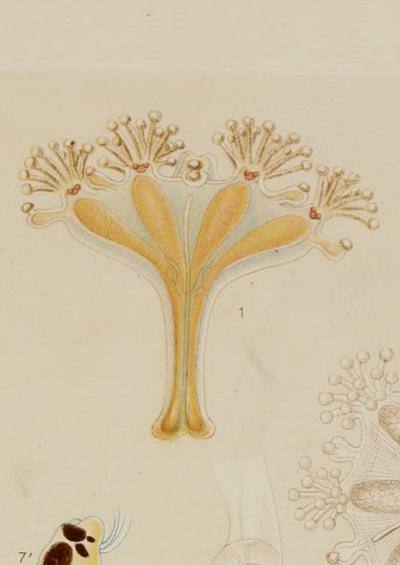 Haliclystus salpinx Clark - Medusae of the World by Alfred Goldsborough Mayer. 1910. Medusae of the World. Volume III, The Scyphomedusae. By Alfred Goldsborough Mayer. 1910. Plate 56, figs. I to 4. Haliclystus salpinx, CLARK, H. J., 1863, Journ. Boston Soc. Nat. Hist., vol. 7, p. 563. ACASSIZ, A., 1865, North Amer. Acal., p. 64. HAECKEL, 1879, Syst. der Medusen, p. 388. (?) Lucernaria salpinx, GRAEFFE., 1884, Arbeit. Zool. Inst. Wien., Bd. 5, p. 344. Disk 25 mm. wide and (with the stalk) 20 mm. high. The 8 adradial arms are 45 apart, and their ends are rounded. Each arm bears 60 to 70 very slender tentacles, the globose tips of which are smaller than in H. auricula. The 8 marginal anchors are as long as the arms, slender, and obliquely trumpet-shaped. The edge of the trumpet is considerably thickened except at a narrow space on the proximal side, by the development of adhesive cells. The center of this terminal expansion is occupied by a single tentacular remnant about as long as half the breadth of the trumpet. Aboral stalk relatively longer and more slender than in H. auricula, 4-sided in cross-section, with 4 longitudinal rows of interradial muscle-fibers. The stalk is 4-chambered and about 12 mm. long. The 8 genital organs are not so widely separated as in H. auricula; their broader ends project only about half-way into the arms. The genital sacs of each gonad are arranged in 4 radiating rows, the marginal rows being shorter than the 2 middle rows. All of these sacs are of the same size and there are 40 to 45 of them in each row. This species was obtained by Stimpson at Mount Desert Island, Maine. The best description of it is that of Clark, 1863. Our figures are drawn from specimens obtained upon eelgrass on the inner side of Ram Island near Manchester, Massachusetts, on September 7, 1905. Graeffe, 1884, appears to have found this species at Trieste, Adriatic Sea, in June and July.